Welcome to our Dance Marathon team fundraising page! 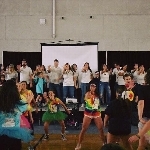 Our team is participating in Dance Marathon where we join together to raise funds for our local Children's Miracle Network Hospital, which treats children from our area and provides life-saving care to sick and injured kids in need. Together we can save kids' lives - we need your help! Thank you for supporting our efforts! Together, we're saving kids' lives.